The industry's first AI-driven predictive analytics platform for discrete manufacturers and machine builders. Our award-winning Industry 4.0-ready solutions work out-of-the-box to increase equipment productivity and efficiency through Industrial IoT edge connectivity, real-time visibility, deep manufacturing analytics, and predictive and prescriptive alerts. Self-install IIoT Connectivity captures data from any modern or legacy machine with included edge device hardware. AI and Machine Learning algorithms visualize, diagnose, and predict problems in real time based on collected data. Real-time visualizations and predictive notifications enable your team to take immediate corrective action. Most Industrial IoT implementations fail due to lack of machine connectivity and system integrations. MachineMetrics has simplified IoT with an inexpensive edge device that enables ethernet, wifi, and cellular communication while connecting directly to machine tool PLCs and controls. Add your own sensors to connect to legacy equipment with digital and analog I/O that is configured and managed through a web interface. Build your own Industry 4.0-ready vertical applications through open APIs or leverage the out-of-the-box vertical applications built for discrete manufacturers that use CNC Machine Tools. 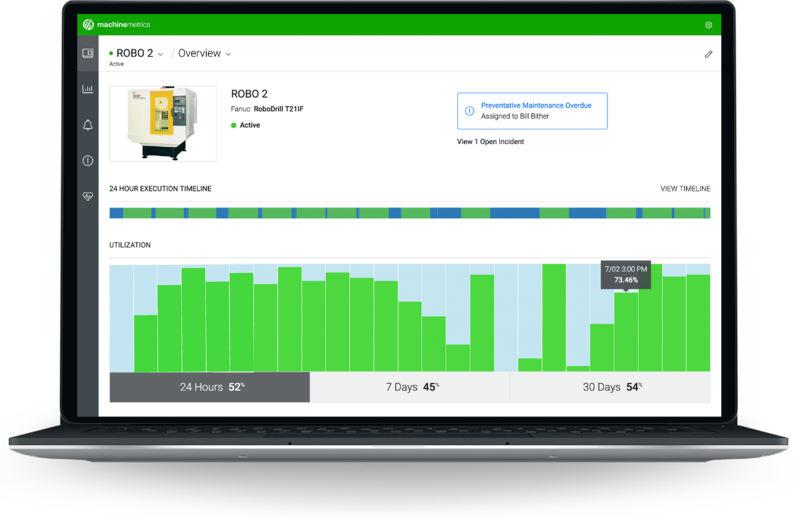 Featuring simple self-install IIoT connectivity that integrates with ERP and MES, real-time production data is visualized with customizable dashboards that empower workers to meet production goals. Identify bottlenecks using deep analytics provided by numerous reports such as job & operator performance, OEE, cycle analysis, machine utilization, and downtime history that enables production managers to make more informed and confident decisions. This increase in visibility allows manufacturers to operate more machines with fewer resources, increasing uptime and production by more than 20% on average. Keep Machines Running with real-time condition monitoring, preventative and predictive maintenance. Monitor and manage the health of your equipment in real-time with “self-install” connectivity. Receive alerts when anomalous behavior occurs, such as a tool that's about to break. Manage preventative maintenance schedules tied to actual machine usage or conditions, and be alerted when maintenance is due. Track equipment utilization over time to manage capacity. Configure alerts based on any machine condition or alarm. Optimize tool life with detailed analytics and reports. An ideal platform for a maintenance team to keeping equipment running. Designed specifically for CNC Machine Tools. Equip your Fleet, Reduce On-site Service Calls and Provide Preventative and Predictive Maintenance. Give service managers and technicians the ability to gain insight into customer's equipment health with real-time and historical condition monitoring and alarm analytics. Differentiate from competitors by enabling IoT on your equipment, also giving your customers better insight into their machine performance and health. Suggest and manage preventative maintenance schedules for your equipment. 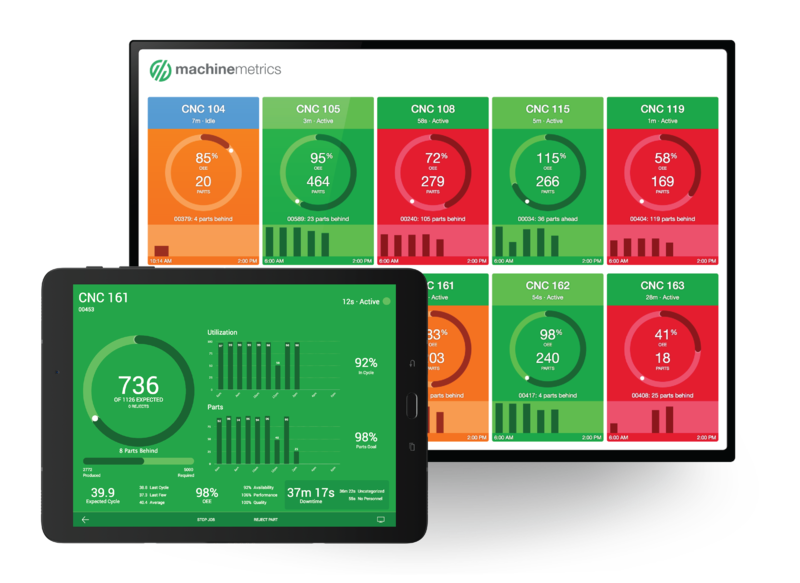 Work with the MachineMetrics Data Science Team, experts in machine learning, to develop predictive maintenance algorithms specialized for your equipment. It takes a team to transform a business. Designed for the Shop Floor to the Front Office. 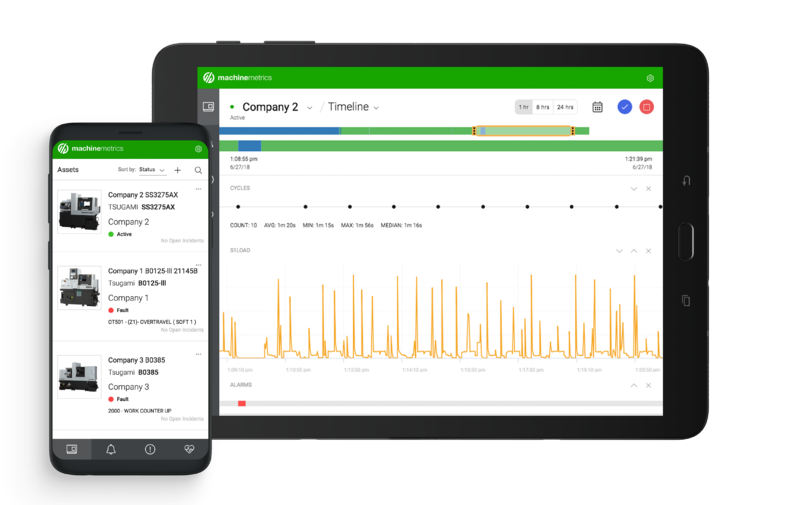 Eliminate bottlenecks and empower workers with real-time machine connectivity, visual dashboards, and predictive alerts. Make faster, smarter decisions with real-time data. Cloud machine monitoring & OEE software collects data from all machine types so you can optimize your production performance. 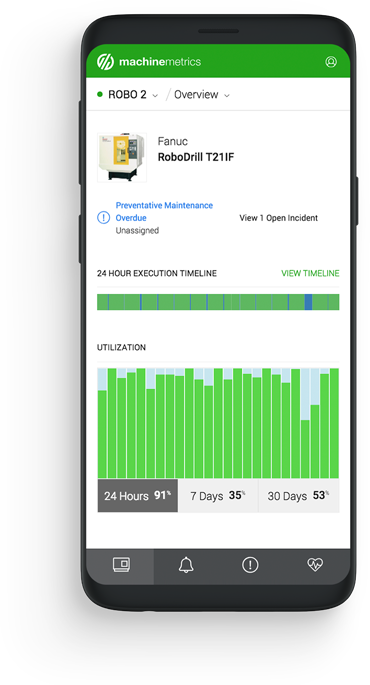 Give your maintenance teams the ability to monitor, manage, and analyze equipment health in real-time. Improve CNC Machine Tool health with real-time diagnostics, condition monitoring, manage preventative maintenance, and receive predictive alerts. Transform your approach to selling machines today! At the MachineMetrics developer hub you'll find comprehensive guides and documentation to help you start working with MachineMetrics as quickly as possible. Let's jump right in! "MachineMetrics enabled CPM to increase capacity by $1.5 million in 2016 with no additional machines!" "There's Fastenal pre-MachineMetrics and Fastenal post-MachineMetrics. We can’t imagine what life would be like if you took it away." "MachineMetrics has provided us valuable insight into our own production, allowing us to reduce our lead-time while improving On-Time Delivery and quality." Ready to empower your shop floor? Get started with manufacturing analytics today.